Created to commemorate the 100th anniversary of the Abrons Arts Center and the lives of the sisters who founded it, Sisters’ Follies: Between Two Worlds, harking back to both the Ziegfeld Follies and the roots of avant-garde theater and dance, is spectacle of the highest order. It incorporates scenes drawn from or inspired by many of the works the Lewisohn sisters actually produced in their time running what was then called the Neighborhood Playhouse, and is packed chock-full of flying ghosts, talking sculptures, puppet camels (and monkeys, and sea monsters, and fish, and dark spirits). It’s incredibly intricate technically, with every element working together: not just the usual trifecta of lights, costumes and sound design, but projections, a vast array of puppets created from the workshop of new MacArthur Genius grant–winner Basil Twist, choreography of both dance and fights (much of both done on flying rigs). Everything drips with glitter, and musical extravaganza follows musical extravaganza. Loren Noveck: That piece of theatre was completely over-the-top in every possible way, but if it hadn’t been, there would have been no reason for it — it wasn’t a script that had intrinsic value as a story, other than as a commemoration of a place whose history is interesting. But that didn’t necessarily need to be done in the theatre except that it was done with such extraordinary theatricality. LN: It’s created by Basil Twist, who is a puppeteer, but there was so much amazing puppet-craft here beyond what was necessarily called for by the narrative: things like the various animals in the Egyptian harem scene, where it’s just in the background that she’s getting attacked by puppet monkeys, or the kraken in the sea scene — that was just there because Twist knew how to do a really amazing kraken. Therefore, there’s a kraken. I love that. I love that kind of theatre and I’m a sucker for it when it’s done well, with all the proper resources for that sort of gorgeousness. TS: That’s the important point, isn’t it, because when it’s not done well, it can just feel like the kitchen sink thrown at something. Having said that, this did feel quite thrown-together, which is a lot of its charm. Julie Atlas Muz’s and Joey Arias’s performances had a slightly ramshackle air, but the rest of it — all the visual cues, all the little details — was done with such precision, and that was quite a charming contrast. I thought sometimes the visual jokes went on a bit too long, sometimes the sisters battling in the air could have been a bit tighter. But there were a lot of surprising things about the piece. Just the great use of space — things like the faces on the top of the proscenium (the usual comedy/drama masks were overlaid by uncanny animated projections of the sisters’ faces that conducted entire conversations). LN: Yes! I know that theater has a proscenium, and I remember thinking when we sat down that it looked more elaborate than I remembered it. And I wonder if they actually put those particular masks up there in order that they could project onto them in that way. LN: — more than slightly camp! TS: Very camp, I should say. You have to know when to rein it in and when to let it loose, and I think this worked very well. And I know it’s not particularly original anymore, but I liked that it mixed in the modern songs and the old songs. The bit on the boat when she was doing the pill song (‘Go Ask Alice’ by Jefferson Airplane, sung by sister Irene about/to sister Alice)—that was just hilarious. LN: And I loved that it did sort of hark back to both something like the Ziegfeld Follies and that late nineteenth-century / early twentieth-century stage melodrama where they drown everybody on the stage, or they burn up an entire city. It also reminded me of a stage adaptation I saw a few years ago of Edith Wharton’s The House of Mirth, and there’s a scene at a fancy society party where they do tableaux from history and classical art, and all the society ladies get gowned up in elaborate costumes. Here, obviously these were more scenes than just tableaux, and they sang and danced and had vaudeville roots. But I liked this approach to the theatre history that the piece was negotiating. Because every time it just showed pictures/slides (certain segments featured slide shows with historical images), it threatened to get really dry, and then it went back into insanity. TS: And most of those pictures were less visually sharp, so a lot of the time I wasn’t really sure what that was a picture of, and I wonder if that was a deliberate contrast of the history as opposed to the drama. Or did they just not have any good pictures? TS: You’re right—that idea of almost wheeling on one scene, drawing back the curtains, then wheeling it off, it was done really well, and also captured not just the melodrama, but also that slightly weird, slightly racist exoticism that used to exist in the theatre. TS: You know, we’ll have the comedy Indian dance, and they managed to do that without being offensive, which I think is a tricky balancing act in the modern theatre. LN: I think perhaps by virtue of having so much of it. It’s like South Park—any of those jokes taken on its own is incredibly offensive, but somehow you do seventy-four of them and you realise that it’s a take, and it’s actually negotiating that kind of thing, not doing it. TS: The Indian one (Sanskrit or Hindu myths), the Celtic one (‘The Karn of Koridwen’, a modern dance piece), which was deliberately, insanely over the top. LN: I was thrilled to hear Irene say that “Martha Graham learned everything she knew from me,” because I’d been thinking, this seems like a parody of Martha Graham, am I overthinking this? when the Celtic one was going on. TS: I liked that it wasn’t afraid to show its own smarts, but wore them lightly, which I think is always a nice balance. Especially when you are basically dealing with theatre history, I mean, how do you do that in a way that isn’t totally dry but equally, you don’t have to pretend that you’re not doing what you’re doing? LN: In a way, you’re doing dioramas, you’re just doing them really spectacularly well. TS: What did you think of the break, when Arias and Muz came down from the flying rigs and started talking directly to the audience out of character and out of costume? LN: I don’t know that I thought it was necessary, but they’re both such iconic New York downtown theatre performers that it was sort of useful to have them identify themselves. They are in a way the inheritors of two separate strains—old-school drag (Arias) and the avant garde performance art/burlesque scene (Muz)—that I think descend from what the Lewisohns were doing. So I felt like them stamping the piece as belonging to them was useful in that context. Even though I’m not sure the scene itself worked all that well. LN: Well, the whole thing is really hammy. Especially because all the other performers, the puppeteers and the one guy (who plays all the strong silent male lead roles in the various sequences) were so anonymous. TS: And they used it incredibly well. Instead of just thinking, we can do this, they always thought of clever, smart, and beautiful ways to do this. The last scene in particular, from ‘The Dybbuk’—the opening visuals are just stunning, and surprising, and unexpected in lots of different ways. But I thought the end of the scene was just stunning and subtle, with the monsters and the puppetry, and the design. TS: Yes! That was like CGI-movie level. LN: That’s Basil Twist. He is consistently amazing. Plus I’m a total sucker for puppetry—if you say puppets, I’m in. TS: It is such an incredible art form, and the show tonight didn’t ever feel like it was just doing one thing. Obviously the format really gave them wings, gave them permission to do that in lots of different ways, and it worked. LN: It was a piece about ghosts, but I think it also tapped into the uncanniness of puppetry, and the way they can be ghostlier than the ghosts, if that makes sense. To me, that kind of shiver that you get when you see something like those ghost puppets rising, that’s how I think I would feel if I saw a real ghost. TS: And that black figure at the end—that was genuinely unsettling. LN: Especially because you saw it earlier, but there was scrim, and there was a lot of fog, and a lot of other things going on…you weren’t really sure what to think. TS: And it’s hard, when you’ve spent the whole thing making people laugh, to then actually make them feel quite genuinely unsettled—that’s a hard balance. And I thought it worked really well. LN: It’s commemorative, no one’s going to do it anywhere else, it’s not going to live forever. LN: And the Egypt one with all the animals, the camel having a fight with the horse — I mean, there was so much going on in the background. TS: The Martha Graham thing did also feel slightly flat compared to the drama of the rest of it. But it’s always the nature of these one-scene, every-scene-being-different things, some were better than others, and it wasn’t necessarily a hugely coherent whole, but I don’t think that matters. It got by a lot on charm and beauty, and exuberance, but I loved it. I thought it was really unexpected in so many ways. And it’s great to watch a play where you genuinely have no idea what’s going to happen next. LN: But you know it’s going to be beautiful to look at. I mean, when the ghosts’ heads come off? I thought, I didn’t even know that was possible—there’s more puppetry happening than I’m even aware of. TS: And the great way she got sucked into the vacuum cleaner. TS: I thought some of the kung fu fights went on a bit too long. LN: I think a lot of the individual bits went on too long, but on the other hand, you’re throwing that much spectacle at something, you might as well milk all your sparkle and whatever else. TS: And it wasn’t a long show, right? It didn’t overstay its welcome, as a whole. I love that roller-coaster feeling of what the hell is going to happen next? LN: And where are they going to pop out? TS: What song are they going to burst into? LN: And all of the technical elements: the projections (Daniel Brodie and Gabriel Aronson), the costumes (Machine Dazzle), the sound design (A-Key/Takaaki Ando), the live orchestra (directed by Wayne Barker). And it’s using all the physical possibilities of the theatre: the prodigious wing space, the fly space, what can I do that’s going to maximise all the cool features of this place we’re celebrating? TS: It’s interesting you say that, because as someone who’s never been to that theatre before, I thought the show was amazing, but the theatre itself was also amazing. And that is a gem, because you come to what you thought would be a small, old downtown theatre, and all of this stuff is capable of being done on the stage. It’s massive. 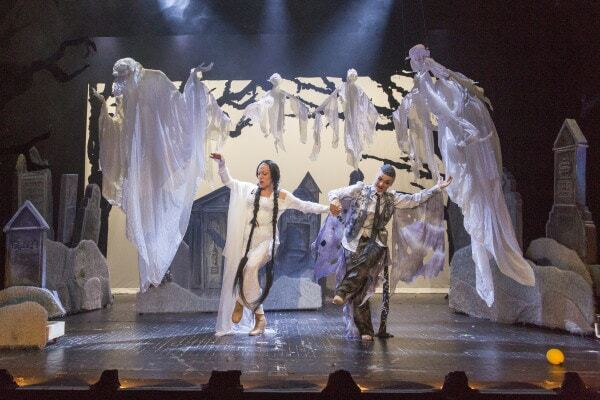 TS: It did make you believe, as one of the scenes mentions, that there could be a cast of seventy in the wings. LN: Exactly. And I loved all the allusions to theatre history and especially New York theatre history. TS: It’s nice that they tied in all that but still made it feel inclusive if you didn’t know it. I think, with a show like this, it’s easy to think, who’s going to see it except people who know the history. It displays a generosity of spirit to not make it too closed: we’re putting on a giant party, and if you gate-crash it, you can still enjoy the drinks. LN: You’ll have a great time.